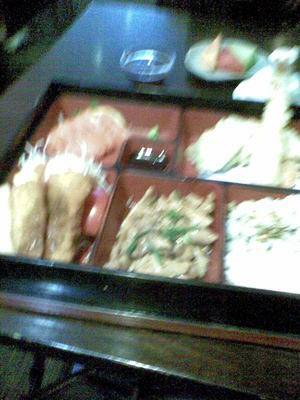 [ADVERT]Chiba Japanese Restaurant is in Moonee Ponds. It is about a one minute walk from the Moonee Ponds Station in a little laneway called Hall Street. When I went, which was about two years ago, I didn't really enjoy it all that much, but I have heard that things have changed for the better. When I went, everything was mass produced and MSG laden. I had the bento for $14, which included miso soup, rice, sashimi, tempura, chicken, fried fish and fruits. I loved the sashimi, as this was fresh. I didn't really like the chicken as it was too rubbery, but I loved the tofu bits in the miso soup. The soup would have been a bit boring without the tofu. The rice was overcooked though. The tempura was a bit too oily for my liking, so much so that it bordered on being greasy. All in all, I would love to try the sushi there again.